EASTER SALE!! -CLICK FOR COUPON!! Take advantage of this great promotion. Create a sophisticated presentation at your next catered event or special meal with the Decorline Collection of plastic plates. Stunning silver rim gives this heavyweight plate a distinct and charming style that combines the convenience of plastic with the elegant appeal of China. 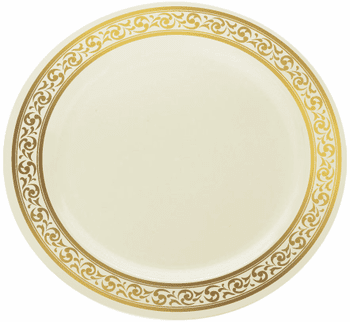 Decorline Cream With Gold Rim 10 1/4" Plastic Banquet Plates 10 Ct.
Decorline Cream With Gold Rim 9" Plastic Dinner Plates 10 Ct.
Decorline Cream With Gold Rim 7" Plastic Dessert/ Salad Plates 10 Ct.
Decorline Cream With Gold Rim 12oz. Plastic Soup Bowls 10 Ct.
Decorline Cream With Gold Rim 5 oz. Plastic Dessert Bowls 10 Ct.
Gold Splendor LOOKS LIKE REAL!! Gold Plastic Forks 20ct. Gold Splendor LOOKS LIKE REAL!! Gold Plastic Spoons 20ct. Gold Splendor LOOKS LIKE REAL Gold Plastic Knives 20ct. Decorline Cream With Gold Luncheon Napkins 20 Ct.
Decorline Clear With Gold Rim 10oz Plastic Cups 10ct. Join Our Newsletter & Save 10%! © 2019 Party Source, All rights reserved.